Ely High School 1905-1972 - What's New? Ely High School 1905-1972 - What's NEW ? Our next Annual Reunion Luncheon will be at Ely Golf Club on Saturday May 18th 2019. If you are interested in coming please click here to open an email in which you can request booking information. Sister Mollie Evershed is featured on the British Normandy Memorial website. There is no permanent British Memorial to the 22,442 men (and two women) who gave their lives during the D-Day landings and the Battle of Normandy. She was posthumously awarded the King's Commendation for Bravery for her part in saving the lives of 75 casualties at the cost of her own when her hospital ship was mined. Sister Mollie Evershed, whose name is on the Soham War Memorial, is one of the women. She was a pupil at EHS 1928-32. Evidence from the EHS archive on this website has been used on British Normandy Memorial website. Her story is narrated by our Annual Luncheon organiser, Christine Fuller. To see and hear this and to find out about the Memorial Appeal please click here. We suggest you first read the page and then go back up the page to play the movie clip. The story has also been covered by the Ely Standard - can you help us to trace Mollie's niece Christine Tricker who was at EHS at the same time as Christine Fuller (née Bell)? Janet Hill (née Robinson) identifies herself on the 1959 School Photo in section 13 row 5. Janet queries one of the other names in that row so as is our practice we show both until someone else comes along to decide it. Sylvie Short (née Coleman) writes: While browsing our website recently, I had the idea that it might be fun to collect some memories of our school days. Then I realised the idea was not original; I think Jackie Sotheran (née Bidwell) may have been starting to try and do this. Before she died she asked me to send her 'the one about the mercury' which I never got round to doing. So this one's for you, Jackie. Please share your memories, and not just pranks. What about musical memories, sporting memories, plays etc.? I know we have photographs, but it would be lovely to have some personal recollections to put meat on the bones and try to capture the beating heart of the school. It won't be long before there will be no-one left who went to Ely High School (as it was), and without Ely High School I for one would not have been able to do what I've done with my life. January 2019 - a Happy (and healthy) New Year to all! If anyone has memories of them, please please contact us. Jane Hills (née Inman) makes contact, asking EHS friends to contact her via e-mail at janehillsATgmail.com [replace AT with @]. She recognises Moira Gotobed, Frances Wylie, Rosemary Ward, Christine Simpson, Christine Wakefield, Rosie Crow, Bridget Riley, Anne Wade, Olwyn Gladwell etc. "We were all in the Upper Sixth Form in 1967 with Mrs. Jones as our Form Mistress. Mrs. Hawes taught us A Level English and Miss Brinkworth taught us A Level History. I have lived in the US since 1974, but return to Cambridge every summer for 5-6 months." Jeanne Harper (née McCullagh) died on 16 December 2018 in Shropshire. Christine Fuller writes: The McCullagh family consisted of two boys and six girls. Five of the girls attended EHS: Eileen, Norah, Jeanne, Elsie and Mary. Their lives were spent in Ely as a close family unit and even when some of them moved away when they married they still retained that special family closeness. Eileen passed away in 2009, in Ely. I have always held the McCullaghs in very high esteem as each member is very quiet, kind, caring and concerned in every circumstance. I have known them throughout my life. Jeanne was truly a lovely person. Jane Surgey was on the EHS Staff from about 1952 to 1959 as Head of Art. Peter Baxandall writes: We were delighted to find on the EHS website a ‘tribute’ from Margaret Prior, née Smith (in school 1950-1955) among the ‘memories’ in the last issue of the School Magazine. It mentions "I joined the Sketching Club, run by Miss Surgey, whom I remember as a small blond, enthusiastic artist." Jane Surgey is still (nearing 90yrs) a ‘small blond enthusiastic artist‘ and she is also my wife! Christine Fuller has been informed of the death of Helen Smith on 1st September in University College Hospital, London, after a short illness. Her three cousins were with her. Christine says "Helen will be remembered as a serious and studious girl at school and as a valued colleague in her career". Her brother Dr Edward GR Smith was in the 1956 entry at Soham Grammar School. He died of cancer in 2013. Helen was also a good friend of the late Jackie Sotheran (née Bidwell). Tamaris Taylor (née Askem) came over from Ireland to take part in a talk at the recent Soham Grammarians' Annual Reunion Lunch celebrating the life of her late father, Mr Peter Askem who taught Art and Pottery there 1954-72. He was also involved in local adult education. He became a Chief Examiner. The Askems took a party from EHS and SGS to Italy - to see the talk click here. Christine Fuller writes: "Our 2018 Reunion was a great success and held in beautiful weather at Ely Golf Course. As we gathered we were able to watch the Royal Wedding on television and we then enjoyed our excellent lunch whilst overlooking the greens and trees bathed in sunshine. A number of girls had travelled long distances to be with us, even from the USA. We thank the chef Martyn and his staff who prepared and served us our meal very efficiently. Next year we will be returning to Ely Golf Club for our Reunion Lunch on Saturday May 18th 2019. Jean Cohen (née Flude) living in the USA thinks she has spotted herself on the 1954 School Photo; "I lived in Sutton and was at the Centenary Lunch, where I met up with an old friend Wendy Dorling (née Hopkins). I met Georgina Smith (née Shane) at school and we have remained in touch since we were 10 years old, she also lives in the States". Our Annual Reunion Luncheon will be on Saturday 19th May 2018 at Ely Golf Club, Cambridge Road, Ely. For the booking form and full details please contact Christine Fuller or at 12 Bamford House, Deacons Lane, Ely, Cambs., CB7 4PT. We have heard of the death of Peggy Tye. Please let us know if you can confirm/add more about her. Jeannette Blake who passed away in January was a gifted artist and went on to teach art in London before returning to the Ely area in her retirement: via Christine Fuller. Four-time Victrix Ludorum at EHS who went on to teach. Distinctions in History & General Science at O-Level, Prefect 57-59, Deputy Head Girl 59-60. A-Levels Bible Knowledge, History. She travelled widely with her husband on walking holidays such as in New Zealand. Her sister Mary also taught: via Christine Fuller. Pam Phillips disagrees with four of the names on the 1963 School Photo. The ones in question are 9/14 r4 no 3, 10/14 r6 n0 1, 12/14 r6 n0 1 and 14/14 r6 no 1 - in each case more than one name has been suggested, we are hoping some of you can help decide which, if any, are correct. Please contact the editor. Pam Segers (neé Phillips) makes contact and adds herself and Rosemary Dunnett to the July 1963 School Photo. Best wishes to all for Christmas and the New Year! Judi Langley makes contact from Dorset. Judie Fernie, a Head Girl 1967-68, features in a talk given by her brother Prof Geoff Fernie at the Soham Grammarians' Reunion Lunch in October. The work Geoff directs at the Rehab Institute in Toronto will be of great interest to those of a certain age ... and above. Carol Whitby (née Grint) makes contact -"I joined Ely in September 1965 starting in the second year, having done my first year at Wisbech High School. My final year was 1970-1971." Carol adds 20 names to the 1967 School Photo. Mr Karl Pickard writes: "I used to attend auctions regularly. This postcard of EHS Form Remove ? 1924 almost certainly came from an album bought at Willingham auctions or possibly St Ives auctions." It shows: Nancy - Alethea Summerlee - May Potter - Miss Goodin - Freda Webster - Elsie Thomson - Jean Petit - Kathleen Jackson - Marjorie Bradshaw - Marion Drake - Marjorie Howard - Peggie ?Barret - Marjorie Everett - Betty Smith - Jean Smith - Ida Lincoln. Carolyn Brunt (now Castledine) who was at EHS in the 1960s makes contact from Essex. Our Annual Reunion Luncheon is on Saturday 20th May 2017, gathering from 11.30 to eat at 1pm. It is at a new venue - The Rosery Hotel, Church Road, Exning, near Newmarket. The cost is £20 per head. The booking form and details of how to get there can be seen by clicking this link - booking form and information. Elizabeth Howard, who was Vice-Head Girl in 1937-38, has died at the age of 96 according to an obituary seen in the Guardian, 30th January 2017. She had a distinguished career in teaching. There are a number of references to her if you search on her name on this website - see also In Memoriam. Marlene Corke (née Brooker) makes contact from Norfolk: I attended EHS from Sept 1960 to July 1962 and then we moved to Southwold in Suffolk. My mother also attended the school and looking on the 1938 photo I have spotted her. In June 38 she would have been 13, turning 14 in the following month, 5th July. Her maiden name was Monica Hamence, and she lived in Sutton. When she left school she worked for Bonnett’s bakery and restaurant in Ely which was owned by her Aunt and Uncle. She died in 2011. Mabel Hamence, who is shown in the 1913 entry, was my mother’s aunt, (her father’s sister) - she became Mrs Eacock. News has been received of the death after a long battle with cancer of Heather James, a regular attender of our reunions. When more information is available she will be added to our In Memoriam page. Our condolences go to her family, especially her sister Diana, who was also at EHS. The Soham Grammarians have their Annual Reunion Luncheon at Soham Village College on Saturday 1st October. The speaker will be Mike Barningham SG60. If you have a Soham Grammarian in your family or among those you know, please tell them about it. The Booking form can be printed off via SG Reunion booking form. This long held dream of Lorna to make these voices more widely available has now been realised and many congratulations are due to her for her tenacity and foresight. Would you kindly put this information onto the EHS website as many of the former pupils will have known those who are speaking and it will bring back so many memories. Christine Fuller writes: Once again a super Reunion with everyone so happy and relaxed and we enjoyed another delicious buffet thanks to Sally. This year I asked Barbara Cole to do a presentation because she and her sister Carolyn and brother in law had spent time helping at the Victoria Square Centre in Athens as part of the Salvation Army team helping cope during the massive migrant crisis. A collection was made raising £250 which will go directly to Athens to help during this continuing and desperate situation. Barbara has asked me to say a big THANK YOU VERY MUCH. The date for next year is 20 May 2017. Mrs Christine Bennett writes: I am a genealogist researching my own and my husband's ancestors. My husband's maternal family name is RICHARDS and in my research I have found information relating to Miss Constance Lilian Cooper Richards' teaching career, part of which was as Senior Science Teacher at Ely High School for Girls, from 1927. She is believed to have died in 1980 in Salisbury, Wiltshire. She is mentioned a few times on your website. It is not clear how long she taught at Ely. If anyone can add to this story, please contact the editor. Rosy Wolfe (née Broomfield) corrects the ID of herself on the 1963 School Photo and believes she has spotted Sandra Reynolds. Pat Merry (née Markwell) makes contact and provides news about Susan Porter (see below). All the Best for Christmas and the New Year. If your Christmas card list has reminded you that you are in touch with an EHS that we don't appear to be aware of, please contact us. Sharman Edmunds was at EHS from 1965 - 72, joining halfway through the first year. Having lived for many years in Hampshire, she has moved back to the area. Margaret Allen (EHS 59-66, now Cockburn) writes: The 1915 photo has interesting connections for me. Dorothy Cranwell was my first teacher at Witchford Primary School in 1954. I was in her class for two years and I remember her fondly. Dorothy Defew was English teacher and Deputy Head when I was at High school and I also have fond memories of her. I think my Aunt, Constance Allen, must also be in the photo as I know she was in the same class as Miss Defew. She went on to a teacher training college in Norwich but unfortunately died before I was born. Sarah Hellon's (see last month) photos from her mother Joyce Elizabeth ('Babs') Day, who was at EHS in the 1920s, have now been added to the Sports and Album pages. Jayne Russell (now Taylor), sister of Anne, was at EHS starting in 1968 (left in 74) . She now lives in Essex. Sarah Hellon has recognised her mother in the 1925 School Photo (7/9). "Her name was Joyce Elizabeth Day. She was a day pupil, the only child of Ernest Henry and Grace Ellen Day of Bedwell Hey Farm, Stretham. She would have been 12 years old. She had hair long enough to sit on, and wore it in plaits. She had to ask the bus to stop at the end of the farm drive, every day, and on at least one occasion, one of the boys on the bus tied her to her seat by her plaits! She was carried on to Stretham, and consequently late home! I know her best friend at school was Yoda Jackson, but I don't know if she is standing near my mother. Judi Davies (née Cullum) adds herself and several others to the 1963 School Photo. She notes that it seems that not many appear to be listed as in touch. If you are ex-EHS and not on the in touch list, please do consider rectifying that. Christine Fuller writes: "This year I kept to the same formula so we met at the Ely Beet Club on Lynn Road, Ely on Saturday 16 May from 11.30am onwards and enjoyed a 3 course buffet meal prepared by Sally and her staff. I chose the same menu as it met with the known dietary needs but I rang the changes with some of the starters and desserts but kept the mains as before. Those with a dietary problem with the meal choices were asked to let me know. The price was the same as last year at £25 per head to cover the cost of the excellent meal as well as the necessary extras such as hall hire, postage, stationery, etc. I also asked for an indication of the friends people would like to sit with and I did my best to reserve however many seats were needed so that they could be all together. My aim is to ensure that the Reunion is a happy, relaxed and informal occasion at which any EHS Old Girl is very welcome." "The Reunion was once more a happy and successful day. The date for the next one has been booked and confirmed for Saturday 21 May 2016 - same venue with Sally again providing the excellent buffet. So keep a note in your diaries and tell any other Old Girls who may wish to join us." Scrap Book of the Isle of Ely is the title of a collection of references to the 'forgotten isle'. Many EHS girls and SGS boys lived in that part of Cambridgeshire. Mike Delanoy (SG48) with his wife Lorna (née Freeman, EHS 51) have collected memorabilia over the years and have produced this little book. It costs £4.50. All profits go to East Anglian Children's Hospices. It can be bought from Burrows Bookshop in Ely or ordered direct from 01353 777691. Pamela Carlton, who will be attending the Annual Reunion Luncheon, is spotted on the 1952 School Photo. June Strawson née Bent, of Downham Market, who had been to many Reunions until illness and infirmity prevented her attending about three years ago, died aged 86 on March 20th, 2015 peacefully at Holmwood House. Her funeral service is at St Mary's Church, Bexwell on Monday, March 30th, at 2pm, followed by interment at Rouses Lane Cemetery, Downham Market. Betty Peacock (née Wells) makes contact and identifies herself on the 1959 School Photo. Lesley Chilcott (née Sawer) who came over last year from the USA now appears on the list of those in touch. Christine Fuller emails: "Sadly I was informed over the festive period that we have lost two former EHS scholars Doreen Cox (Mrs Arnold) and Pamela Easy (Mrs Hardman), both of whom had attended reunions for some years." Please contact the editor if you can add more on them for our In Memoriam page. Anne Blake writes: My aunt May Ellis (née Russell) died on 21st October 2014. May was born in 1919 and was a pupil at EHS in the 1930s. After leaving school she trained as a nurse. During the war she served in the Queen Alexandra Imperial Nursing Service in Africa and Greece. Alison Williams (née Brown) writes: I am happy to report a mini-reunion between me and a good friend I made at Ely High School, Josie Crane. We kept in touch for a few years, then lost contact and only just "found" each other this year, after about 40 years! Josie and her husband will be coming to visit me and my husband in Miami next week - photos to follow! We have learned that Josie Chudyk née Barber passed away on 20 August 2014 after a short illness. Janet Tucker (Lane) passed away on 22 July. She was a regular attender at the reunions but was unable to attend this year because of her illness. Her father and my mother were first cousins so Janet and I shared the same great grandparents and Brian Lane (ex SGS) was her twin brother. 29 July: The death last weekend of Elizabeth Nardone (née Rouse). She had attended many Reunions but had suffered ill health for the last few years. Jan Richards emails from Australia with more names for the 1938 school photo provided by her mother Elsie Mitcherson (née Green) who died in May. See School Photos and In Memoriam. Anthea Williams emails: I am trying to trace some details about my mother's early life and wondered if you could possible help me. She was Elsie Amelia Strong. I know that she was born on 7th March 1913 and I have been told that she attended Ely High School. I know that she was sent away to school aged five or six and that she left school after matriculation. Her dates at the school would/could be from approximately 1918 or 1919 until 1928 or 1929. I think she may be one of the girls in the photograph at the Ely Museum, called Seniors 1920?s. Alma Thorby (Mrs Alma Jefferson) passed away on 6 June 2014, reports Christine Fuller. Alma had been a regular attendee at the Reunions over the years but was too unwell to attend this year. She had lived in Littleport all her life - see In Memoriam. Christine also adds names to the 1927, 1929, 1930, 1933 and 1956 School Photos. Annual Reunion Lunch bookings as of 15th May are shown below (names when at EHS). Christine Fuller later wrote "The Reunion was again a very happy and relaxed occasion helped by an excellent buffet but sadly the photographer from a local paper didn't appear. The next Reunion will be held on 16 May 2015 at the same venue and Sally will be doing the catering." If you do have any group photos from the reunion and can put names to at least some of them, please contact Christine. Bookings are coming in for this year's Reunion Luncheon on Saturday 17th May, again at the Ely Beet Club in Lynn Road from 11.30am. The meal will be served at 1pm. Please click Booking Form for all the details and menu choices. Bookings should please be made before 7th May. Cancellations after that date cannot be refunded. Christine Fuller says "enjoy the occasion with good food, chatter and friendship". See May 2014 for the latest list of bookings. Those from the latter days of EHS or whose children studied Chemistry at the Sixth Form Centre in Ely or at Soham Grammar School, or those who have been involved in village life in Fordham, may wish to be aware that Mr Gareth Wood died at home on 7th April, aged 75. His funeral is on Thursday 17th April at 10.30am at St Peter's Fordham. For further information please see the Soham Grammarians' website. Maggie Darley née Stirrup makes contact from West Sussex: After many years I discovered the EHS site and thought I would get in touch. I attended EHS as a first former in 1964 when I was Margaret Stirrup. Miss Tilly was my first headmistress, then Miss Moody. I was in Alan House. My three wonderful daughters and three grandchildren still live in the Ely area and I travel to the area frequently. I have some good and some hazy memories from that time so I enjoy hearing other people's perspectives. I would like to try and find Elizabeth (known as Jane) Bass who was a good friend at school but sadly we lost touch, so if anyone knows her whereabouts I would be grateful. - the Easter 1932 Ely High School Magazine. In this issue it was noted that "It was sad to say “good-bye” to Miss Piggott and Miss Duffield after they had taught in the Preparatory for over 25 years; they have been succeeded by Miss Pater and Miss Catley." and that "[The] Hall-Gymnasium, complete with all the best equipment and in itself a building the finest that could be wished, had yet been put up with such a very modest outlay that its plans were being copied by the Board of Education for use in other schools throughout the country." All the best for 2014 to all visitors to this website, especially to those who were pupils or staff at Ely High School for Girls. If you have not yet made contact, or have newly obtained or changed your email address - or other contact details - please do get in touch - see the Contacting us link on the left of your screen. Our earliest large group/school photo has just got older! The full photo, reproduced with the permission of the Cambridgeshire Collection, had been intriguing Christine Fuller. She had been looking at Dorothy Defew on this photo. Defe was born in 1901 and it was thought that the photo, originally thought to be pre-1929, was therefore 1920 or earlier. 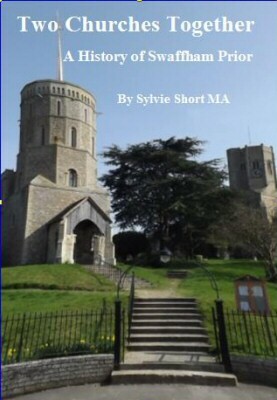 Sylvie Short (Sylvia Coleman at EHS) writes: On 26th October my new book, Two Churches Together - A History of Swaffham Prior is being launched at 7.30pm in Swaffham Prior Village Hall. The book is likely to have appeal to many ex-pupils who lived in Swaffham Prior and the general area. 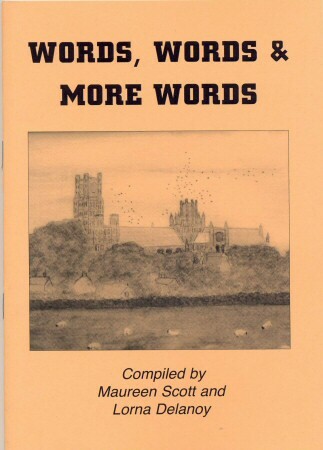 WORDS is a book of local history produced by two EHS Old Girls from the Bedford House days, Maureen Gent (now Scott) of Littleport and Lorna Freeman (now Delanoy) of Haddenham. They have recorded memories and reminiscences of their childhoods in the Fen Country together with lists of words common to the area ... hence the full title of the publication Words, Words & more Words. It costs £3 from Burrows bookshop in Ely. See the Reunion photos page for those taken by Edna Carman (now Collinson) at the 2013 event. If you can add names or provide additional images please contact us - and does anyone have ones taken at the 2012 event - and can you add names to the 2011 photos? At the Reunion we remembered the passing of the last Head Teacher of Ely High School, Miss Eileen Moody who died in early autumn 2012. Her memorial service was held in Ely Cathedral on 16th October 2012. Sheila Joan Hullyer née Lister, 1947 entry, who passed away after a short illness on 23rd July, 2012. She attended our 2011 reunion. Phyllis May Sculthorpe née Peters, of Mepal, who passed away peacefully in Addenbrookes Hospital on 22nd April 2013, aged 83. In the mid 1990s it was the Sculthorpe sisters-in-law, Phyllis and Olive née Blinch who decided to get in touch with their former school mates and organised Reunions held at the Soham bypass motel; these formed the basis of the group that meets today in the Annual Reunions held each May in Ely. The numbers attending grow year on year and we meet in an informal, happy and relaxed atmosphere and keep the memory of our school alive. All are recorded on our In Memoriam page. Christine Bell (now Fuller): I have been looking at Dorothy Defew on the 'pre 1929' School photo. Defe was born in 1901 so would have gone to university in about 1919 or 1920 and by her position in the back row was obviously a senior pupil. I think this could date the photo as 1920 or earlier. I think she got her degree in about 1923 so the photograph is definitely the oldest school photo we have so far. - Jane Elizabeth Leonard (now Goupillon), now in Wales "I was at Ely High School from Sept 1961 to July 1968. The group I hung out with was Rosemary Parsley (is anyone in touch with her? ), Anne and Elizabeth Wyllie, and Ann Penn." Christine Fuller writes: "Sadly the sun didn't shine down on us but the warmth and smiles on peoples faces made up for it at our 2013 Annual Luncheon on 18th May. The next Reunion will be Saturday 17th May 2014." Jackie Bidwell (Sotheran) was one of the key people behind the creation of this website. She died on 14th May 2012 and her wish was that her body be used for medical research. Her husband Harry writes: "On 17th May 2013 there was a Service of Thanksgiving for those who have donated their bodies for Medical Education, Training and Research. It was held at Southwark Cathedral and was arranged by the London and South East Committee of Anatomists. There were Spiritual Representatives of the Medical Schools and Hospitals involved representing Anglican, Catholic and other Faiths. The Welcome, Introduction and Blessing was by the Dean of Southwark and the Address was by The Bishop of Salisbury. Prayers led by a RC Lay Chaplain. The Service was for the 336 donors of the year 2012. All seats in the aisles and nave were taken and late comers stood in the Crossing. Well over 1000 relatives and friends attended. Five of us attended representing Jackie's family and friends. We all found the Service deeply affecting and were impressed with the way the Service conveyed the value to society of donation and the place donors had in the training and development of anatomy and medicine. The ambience of Cathedral, Choir, hymns and sense of involvement of the congregation combined into a confirmation that we were celebrating something special and appreciated. We were pleased that Jackie's generosity had been appropriately recognised." - Kira Morrow (now Davison) I was at EHS 1967-1972. I have a photo which doesn't appear to be on your website. It is from 1967 and the class is the other Lower III to the one you already have. I can't remember the form teacher but I think it was H. I have an online friend who lives in Scotland and I mentioned the school to her one day. She told me her mum was at the school in the 30s and found a picture of her on your website from 1938. Please see above about this year's Annual Reunion Luncheon on 18th. The cut off date is 9th May and early booking is strongly recommended. Please print off additional copies of the form for any you think might like to come. Please let us have your photos of last year's event! A happy and healthy New Year to all. The website editor will be dealing with a small backlog of items - including the 1927 School Photo - to be added to the website. October - December 2012 - all very quiet! Miss Eileen Moody, the last Head Teacher of EHS, has died. Andrew Hinchley, her nephew, writes: "Sadly Eileen has died recently. We are having a memorial service at Ely Cathedral on Tuesday 16th October at 1pm. It will be an hour of celebration of Eileen's life and it would be so nice if there are former pupils or staff who could come. " Christine Fuller adds: A former pupil and member of staff will speak of Miss Moody. Would those of you who are in touch with others from Miss Moody's time please let them know of the service? The following notice appeared in the Ely Standard: EILEEN MOODY Memorial service Ely Cathedral Tuesday 16th October at 1pm. Past students and staff of March High School for Girls, Ely High School for Girls, King's School, Ely and friends from Cambridge U34 all welcome. Music for the service from Bridget Hardy, Mezzo-Soprano, members of the Fairhaven Singers, Jonathan Lilley, Organ, Ralph Woodward, piano. Soham Grammarian Richard Crofts has informed us of the death of his mother Freda Crofts, née Kerridge, peacefully in her sleep on 30th September 2012, just short of her 90th birthday. She and her daughter Alison were both at EHS. A service for her is being held at the West chapel of the Cambridge Crematorium on Monday 15th Oct at 2.15pm, followed by a gathering at the Arkenstal centre at Haddenham. For more detail see In Memoriam. We have heard of the death on 19 May 2012 of Ann Humberstone (Mrs Taylor) in Norfolk. Ann was one of many girls who travelled daily by train to EHS - she and Christine Fuller were in the same class. Sheila Gorham has provided several photos of Old Girls at an event in May 1967, including Miss Moody. Harry Sotheran: "Jackie Sotheran (née Bidwell), my wife of 42 years, has finally succumbed to her cancer. Our children and I were by her side as she passed away on Monday 14th May in Woking Hospice. Her memorial service [was on] Friday, May 18th at 2.30 p.m. in West Byfleet Catholic Church KT14 6DH, and [was] conducted by Father Alex, a family friend. We really hope that at as many people as possible celebrate her life and to remember her brave fight over the last 10 years." http://www.justgiving.com/wokinghospice/donate/ or via a cheque in memory of Jackie Sotheran payable to 'Woking Hospice' c/o the Director of Fundraising, Woking Hospice, Hill View Road, Woking, Surrey, GU22 7HW. They are especially grateful to the hospice for doing so much for Jackie in her final days and as an organisation they rely in large part on charitable donations. The editor writes: Jackie lived not far from me in Surrey. She enjoyed being part of setting up this EHS website. She was always most welcoming and positive. Our condolences go to Harry and the family. Our Annual Reunion Luncheon was on Saturday 12th May at 1pm, again at the Ely Beet Sugar Sports and Social Club in Lynn Road, Ely. It was a lovely sunny day and was a resounding success with 93 attendees - as usual the decibel level was high as much talking was done and delicious buffet lunch was enjoyed by everyone. Christine asked folk who were there on Saturday to send/email her copies of any photos they took that day. The best will be added to our website. The date for 2013 Reunion will be Saturday 18 May at the Beet Sugar Club, Lynn Road Ely and once again Sally will be catering for us. Barbara Register (now Attwood) in Cambridgeshire, is now in contact. Our Annual Reunion Luncheon is on Saturday 12th May at 1pm, again at the Ely Beet Sugar Sports and Social Club in Lynn Road, Ely. The Hall will be open from 11.30am to 4.30pm. Full details can be found by clicking the link above. We are limited to 120 so first come, first served. Please talk to your EHS friends and book soon. Avis Youngs (now Bidwell) makes contact to date (1950/51) and complete the names in the 'St Etheldreda' photo in which she appears, in the Album (via link on the left of your screen). Can anyone more precisely date it? Elsbeth Slater (now LeButt) in Leicestershire, is now in contact. On February 8 1952 the magazine records there was the Proclamation of HM Queen Elizabeth II and on June 12 1952 the School heard the Proclamation of the Coronation in front of the Cathedral. This year sees the Queen's Diamond Jubilee. What are your memories of the historic events of 1952, at school and where you lived then? 2012 sees the 40th anniversary of the end of Ely High School with the change in the structure of education in the area. If you were at EHS at the time please let us have your memories of how this affected you. In 1952 the Summer Olympic Games were held in Helsinki. When the Games were held on London in 1948 did EHS do any trips? Has any EHS or member of your family been involved in any of the post-war Olympic Games and in particular the 2012 Olympic Games ? To all our visitors, a Happy New Year. Maggi Slassor, who has been in Canada since 1974, makes contact and would love to hear from those in her class. To all our visitors, especially those of you who have provided material for this website, our Best Wishes for a Happy Christmas. The 5,000th visit to this site was on 21st December! In 1956 three EHS girls took the women's roles in Soham Grammar School's production of Hamlet, some new photos of which have been found by Soham Village College - see via What's New? in the Soham Grammarians' website (link on left of your screen). Patricia Harwood (now Cicharski), makes contact from France. "I was at Ely High School from 1964-1971 (I think..). I belonged to Knut house, played in the orchestra and sang in the choir. I'd love to meet up with people we knew at school." The published obituary for Mrs Lorna Delanoy (she joined the staff as Miss Lorna Higson) who taught PE and who died in 2007, has also been added to the In Memoriam page. Elena Rice (now Crittenden) makes contact from Australia. We are grateful to Valerie for the loan of this important issue of the EHS magazine. Extracts are being added to the website. The cover can be seen on the Magazines page. During WWII The Jews' Free School was evacuated from London to Ely. In Scrapbook one of their Evacuation Newsletters records the help Miss Tilley gave to them. The Newsletters make interesting reading as they contain news of events in Ely and the villages. The menu on the left of the screen has a new link - Requests. This new page is where we can put information request messages like that from Mark Poynter about his late mother Margaret Wenn. We will forward any information provided. If you are making such a request by post please enclose a reply paid addressed envelope. For how we handle requests to be put in touch with someone, please see Who's in touch? My name is Mark Poynter I am the son of the late Mrs Margaret Ann Wenn Poynter. Margaret Wenn was the daughter of Ethal and Hecter Wenn who ran a public House called the King’s Arms throughout the 1930’s and 40’s. My mother attended the Ely High School for Girls from 1938-1948 (and possibly until 1950). I wish to obtain some information about her school studies. I have been examining various old documents and discovered her Cambridge SCE (School Certificate Examination) report. From the research that I have conducted so far I have discovered that my mother was in the lower form at Ely High and obtained her SCE certificate in 1948 aged 16 with 5 c’s (credit) and 4 p’s (pass) grades but no a’s (very good). Pauline has also kindly set up an EHS page on Wikipedia to help guide vistors to our website. Carol Houghton (now Doe) makes contact to identify herself on the 1963 School photo. Pauline Wilson (now Pink) adds a few names to the same photo. 12 August 2011: 4,000th visit to our website. Thank you all for helping it to keep growing. Gloria Edwards (now Kiteley and living in Suffolk) makes contact. Peter Searle's mother, Gwendoline May Hepher (b 12th May 1916, d 20th November 1993) attended Ely High School for Girls in the 1920s. He has identified her on the 1929 and 1930 School Photos. Her brother, Cyril Frank Hepher, went to Soham Grammar School in 1925. Also attending yesterday were Julia Brown, Claire Fisher, Gaye Kerridge, Debra Nicholls, Jennie Parsons, and Janet Peacock. I can only speak for myself of course but we had a lovely afternoon and before we knew it 12.30 had become 8pm. A promise was made to repeat the get together again and as next year will be 40 years since we left we hope to make it a bigger occasion. Christine - and Claire Darlington (née Fisher) - have added quite a few names to the 1967 School Photo. Jackie Sotheran (née Bidwell) adds a couple of names to one of the Snowdonia trip 1963 photos. Do you have any photos of the 2011 Luncheon for the website? Please either email them via contact@elyhighschoolforgirls.org.uk or send them to Christine Fuller, clearly identified, with reply postage if you want them back please. Christine Fuller (née Bell) writes: The Reunion on Saturday 14 May went off extremely well and was enjoyed by everyone as was the excellent lunch. As usual we nearly raised the roof with chatter and laughter and it was so good for people to meet up with former schoolmates they hadn't seen for 60 years in some cases. Sugar Beet Club and once again Sally will be doing the catering. I was asked by the gathering to continue to lead the group! Margaret Cockburn née Allen, now in Northumberland, makes contact and adds a few names to the 1963 School Photo "You may remember me as Margaret Allen (1959-1966) known at school as Mallen, now Margaret Cockburn. I was surprised that I wasn't in the hockey photo. I continued playing at University and for a local club for many years. I have lived in Northumberland since 1974 but visit Ely regularly as my mother (Dorothy Allen née Day, another EHS old girl) still lives in Witchford." About one in five City of Ely Community College pupils were disciplined on the first day of a crackdown on "low-level disruptive behaviour". The new policies were introduced by head teacher Catherine Jenkinson-Dix. Please click on BBC News report 7 April. 25 March 2011: 3,000th visit to our website. Thank you for helping it to grow. I wonder if you have any further information on the author of that account, Margaret Atkinson? I would like to get in touch with her as I'm trying to find people who witnessed the Coronation first hand. Any help you can provide would be most gratefully received. If anyone is in touch with Margaret please make contact. Via Christine Winter we have learned of the death of Molly Elizabeth Bishop, of Littleport Grange Nursing Home. She passed away peacefully in her sleep on February 23rd, 2011 aged 95 years. Molly was a pupil at EHS in the 1920s. She lived and taught in Littleport. Noticed our updated home page? It now includes the early School Badge from the 1925 School Photo. Can anyone tell us more about this version? - some of Form IVA, 1960? Susan Riley adds names to the 1929, 1954 and 1956 School Photos. Susan and her sister Brigid Knight were both Head Girls. Their grandmother was Mrs CM Taylor, for many years Hon. Sec. of the OGA. Mrs Taylor's daughters Mary and Brenda were at EHS. Brenda married Mr TL Riley, who taught French and was Scoutmaster to generations of Soham Grammarians. Susan and Brigid have loaned some early EHS School Photos - 1925, 1933 and an undated one which matches one of the two undated ones provided by the Ely Museum (the other undated Ely Museum EHS School Photo proved to match Susan and Brigid's 1933 photo). Work is in progress on the 1925 photo. 1933 can be seen via School Photos. Susan and Brigid also add many early photos to the Album and Sports pages, some including Preparatory boys and 1933 staff. The Our Area page has been updated - please contact the editor if there is a website for the community where you lived when at EHS that is not listed. A Happy, Healthy and Prosperous New Year to all our visitors! Did EHS ever produce a Christmas card? - June 1929 School Photo is added, from Miss JM Spreckley via Miss Pam Blakeman. It turns out to be one of the three 'mystery' photos held by the Ely Museum. Time is passing, so please get your older Ely & area relations and friends to look at this and the other early EHS and SGS school photos to see if they can add any names. - 1952 and 1954: Brenda (Olive) Bellwood (Carter) got together a group to look at hard copy of these provided by the editor - Anne Briggs (Carter), Jacqueline Sykes (Audus) and Margaret Haylock - with the result that many new names are added and some existing ones queried .. Margaret Hitch is proving difficult to pin down! - Glynis Bond (Partridge) provides names for 1963 and 1967 adding "I feel I'd like to say that this exercise has reminded me of many good friendships (including some I can't name after all these years!) but also that along with many of these people I recall that to a large extent we received an education despite EHS, not because of it." Brenda May (Human) adds namesand provides a 1971 Form photo (for the latter see via Album) .. also, can anyone tell us more about the other 1971 group photo on that page? Anna Hacket Pain (Macklin) adds 15 names. The addition of a photo of the 1951-52 Hockey 1st XI from the July 1952 EHS magazine prompts the spin-off of a dedicated Hockey page from the Sport page. Hockey team listings and reports (where provided) have so far been added from the following EHS magazines: 1952, 1959, 1965-66, 1966-67 (U15 County Champions), 1967-68 (U15 County Champions), 1968-69, 1969-70 and the last issue. If you have more team photos please contact us. The Staff pages are updated with the comings and goings recorded in the 1967-68 EHS magazine. The 1968 EHS production of Brecht's The Good Woman of Setzuan is added to the Productions page. Does anyone have photos or a programme? Also, reports from the EHS magazines are added for the productions with SGS of The Importance of Being Earnest and From Maenad to Martyr. Are you in the photo of the 1958 Speech Day? - 1954: Wendy Khan (Sealy) adds the 1954 School Photo; Helen Smith, Christine Fuller (Bell) and Jackie Sotheran (Bidwell) are making good progress on adding names, who else can help? 19 December 2010: 2,000th visit to our website. and Miss Tilly records the Golden Jubilee Celebrations. the August 1964 MS Dunera cruise to Copenhagen, Hamburg and Amsterdam. If you went, do you have any recollections/photos? The In Memoriam page is being updated from the EHS magazines and other sources: please let us know if you have or spot an obituary of an EHS. The obituary for Dr Fay Newstead has been added from the British Medical Journal. - Opening Day - we welcome HRH THE DUCHESS OF GLOUCESTER. - Some Buildings Speak - What Does Our School Say ? Do you remember the Coronation of HM The Queen in June 1953? See via Scrapbook > Big Occasions for how EHS and the villages celebrated the event. Miss Defew's companion/housekeeper has donated Miss Defew's fountain pen given to her by her parents on her graduation and her London University BA degree certificate - see via In Memoriam > Miss Defew. Wendy Roberts (Imrie) adds the 1966 Prizegiving programme. Andrew Martin has spotted his mother (then Glenda Dewey) in the April 1967 School Photo. "I was also fascinated to find that there are references to my Great-Grand-Aunts Lois and Winifred Yarrow in the 1936 magazine extracts. Both were teachers for many years. Sadly Lois passed away in 2003 and Winifred in 2006 - neither of them had married." Both have been added to the In Memoriam page. Andrew's website www.familytreeuk.co.uk covers his research into the following family names: Babbage, Bailey, Barber, Bishop, Boulter, Bowers, Clark, Cooper, Covell, Cross, Dewey, Dewsbury, Fison, Flower, Freeman, Giddings, Gilbert, Gothard, Goltrip, Harrison, Howard, Howlett, Irons, Jeffery, Levitt, Martin, Moden, Newell, Newman, Ong, Poll, Steadman,Tall, Tingey, Watson, Whitehead, Yarrow. Miss Pamela Blakeman has verified many of the 1938 EHS School Photo names and added more - and has just found a 1929 EHS School photo. Soham Grammarian Fred Eden has been showing his sister Beryl McIlroy (Eden) the 1938 EHS School Photo and she has been able to add some names, in whole or in part. Rita Mease (Adams) makes contact enquiring about next May's Luncheon - two EHS friends will be over from the USA at that time and would also love to attend. Earlier Wendy said "I've had fun looking through the photos" and she has provided lots of names for the 1963 and 1967 School Photos, contributed to the Staff page and added Class of 61 2000 and 2010 reunion photos to the Reunion Photos page and a 1968 Chemistry Lab photo to the Album page. Wendy has also provided a Hockey 1st XI photo for the 1965-66 season. That has prompted the creation of a Sport page - see via the menu on the left - to which have been removed the sport photos previously on the Album page. Wendy has since added the Staff Egg & Spoon race from the 1968 Sports Day (who else can you name?). Janet Godsell (Horton) identifies herself on the 1956 School Photo. Apologies if you tried using the Search page recently and it did not work. It works now. Julia Lowndes (Brown) makes contact and adds names to the 1967 and 1971 School Photos. Judie Vivian (Fernie) makes contact from California: she'll be going through the family albums when next back in Ely. Rosy Wolfe (Broomfield) makes contact and adds names to the 1963 School Photo. 10 November 2010 - as explained above this website has moved from being hosted on the Soham Grammarians' website to having its own web space at the more memorable www.elyhighschoolforgirls.org.uk ... and the contact address is now contact@elyhighschoolforgirls.org.uk - otherwise business as usual! Please make sure you update on your computer as necessary. Karen Eden makes contact: "I was the last year before they merged with City of Ely College before they went comprehensive, so the final 11+ intake. My mother Brenda Ames was also there from around 1946 onwards. There has never been a reunion for those in my year as far as I know, so this could be a good starting point. I remember well the last school magazine and going up to shake Miss Moody’s hand at the last speech day as the curtain fell on the school as it was. It was a very sad day for all of us, even though we had only been there a year." Karen has named many of her fellow first-years on the October 1971 School Photo. Claire Peirce (Cowmeadow) makes contact and adds names to the 1967 School Photo. Elisabeth Kennard (Atkin) makes contact, promising names for the 1971 School Photo. With Remembrance Sunday this month, it is perhaps fitting to include Edna Gotobed's account written on 4 May 1945 and published in the 1945 School Magazine. She was part of the British relief operation immediately after the liberation of the Bergen-Belsen concentration camp - see via Scrapbook ... WWII. And from the same issue Ella Thurmott's account of VE Night in London, four days later. A page has been created on Miss EE Fletcher, Ely High School's first Headmistress, 1905-1929 and Miss Baird's page has been updated. Jackie Sotheran (Bidwell) has traced some mentions of Miss Defew in the Littleport Almanacks. Does anyone have the 1975 very warm tribute to her memory written by Miss Bertha Tilly published in a local paper on Defe's death in 1975? 1,000th visit to our website! Thank you all and keep providing information, photos and email addresses. Pauline Turner (Cross) died on 15 September. She has been added to our In Memoriam page. The Firby sisters join those in touch. Names are added to the 1959 School Photo, some by Linda Harvey (Cullen) and many more via Christine Fuller (Bell) who also updates the 1956 version. Christine writes "Eureka! I have found some more names for these [1956 & 1959] photographs. In 2008 I took photocopies of them to the Annual EHS Reunion Luncheon and a number of girls put names to faces." The Badges page is re-titled EHS Badges/Uniform. Jackie Sotheran (Bidwell) adds her sister Carol's scarf and prefect's sash. Good, preferably digital, photos of other items are welcome. Julia Murkin, now in Cambridgeshire, has made contact. She has identified herself and many others on the 1971 School Photo - see School Photos. Julia adds: "I attended Ely High from 1968 to 1972 and then went on to City of Ely College and then Ely Sixthform Centre. My friend Susan Glover (now Thornton) was in my class. In 1971 we went on our first French Exchange together, to Orléans. Sue has kept in touch with her original penfriend, Maryline Vaillant, over the years and they have spent many holidays together, both in England and in France. Next year it will be 40 years since this first exchange and Maryline and Sue are planning two reunions: one in France and one in Little Downham. Sue asked me if I could perhaps track down some of the other Ely High girls who took part in the exchange, to see if they would like to come along. Perhaps some of them have kept in touch with their penfriends too?" If you can help, please contact Christine Fuller via the contact email address. We have a number of school photos courtesy of the Ely Museum but we do not know the dates. Originally it was thought that they are from the 1920s but the editor believes some may be 1930s. The editor has placed them in a possible date order, oldest first. News that Pam Blakeman's new book on Ely has been published - Ely Through Time, priced at £14.99, is available from Ely bookshops, the Cathedral shop and Ely Museum. At the top of this page is a new feature called Change Detection. If you make use of it, whenever there is an update to this page you will receive an email. It's all explained when you click on the button email me when What's New? updates at the top of this page and follow the easy instructions. The service is free and the provider gives reassurances that your email address will not be passed on. It has worked well on some of the editor's other websites. Martyn Davies adds more names to the 1971 School Photo, aided by being reminded of names by Anne Blake (Russell)'s Senior School Speech Day programme for March 10th 1972. New material has been collected from Christine Fuller and Jackie Sotheran including some from Pamela Blakeman. Some will recall her as a fellow pupil and some as a member of staff. Pamela is a Trustee of Ely Museum. Christine Fuller has arranged for the Museum to provide scans of the EHS photos held by the Museum, for which we are most grateful. Although it will take time for the website to be fully updated we continue to welcome further new items - please see What's needed? Pamela says she will be pleased to help - " ... a great site and will continue to increase, so congratulations". The representation of the EHS blazer badge has now been replaced by an image of an actual badge, source Ely Museum's 2006 Ely High School: A Brief History, which is the text from the 2005 EHS exhibition at the Museum with additional material from Pamela Blakeman, via her. The home page now states the purpose of this website "Helping those who were at Ely High School for Girls as pupils or staff to keep in touch and to share their memories." Like any school not all have the same experiences hence a small but important update to what it is hoped former EHS will contribute "Please help us to add more photos especially the whole school photos, memories of all kinds, and images of memorabilia." Which 'Old Students of the school' gave The Commemoration? Did anyone keep a record of what was said? Were you there - can you add to this page? Wendy Khan (Sealy) is among those adding names to the 1956 School Photo: 1952 is also updated. Courtesy of Tim Webb of Soham Roots, the final EHS School Photo - October 1971 - is added: some names are added - see via School Photos. the historical bits of the last issue of the Ely High School magazine are added - see via Scrapbook. wearing indoor shoes to protect the floors in the New Building? making a Shoe Bag as part of the first Needlework lessons? the various arrangements for housing the Sixth Form? having to wear a beret to and from school? and how to spot a Prefect? The text of the 1942 Prospectus is added - see via Scrapbook. More updating of the School photos, please let us know if you have names to add or correct. a 'work in progress' representation of the original EHS school badge is added to the home page - are there any digital artists out there? Barbara Yarrow (Day) adds names to the 1959 and 1963 photos. Christine Fuller (Bell): I spent this morning interviewing Wing Commander Ken Wallis MBE (born 1916) who was an Old Boy of EHS in the preparatory school in the 1920s - see Scrapbook. Christine Fuller (Bell): Our website editor visited yesterday to borrow a number of items and to make digital images of others, including school badges. It is hoped to add images of uniform items - what do you still have? see EHS badges via the main menu. By permission of Lorna Delanoy (Freeman), via Christine, the July 1952 School Photo is added. It is something of a challenge as the back three rows are a bit scrambled. Soham Grammarian Roger Sykes, whose mother had the sweet shop adjacent to Bedford House, recalls living next door to EHS - see Scrapbook. School Photos updated including 1956 contributions from Heather Smith (Holliday), although she is not on it - see Scrapbook.